Nearly 30 degree programs and professional certificates offer students the ability to find a program that fits their career goals. Use the interactive explorer to filter by program level or discipline, or use the keyword search to browse our offerings. To honor Texas A&M's close relationship with the U.S. military, we've made it a point to welcome students who are veterans or will commission upon graduation. Learn more about military admissions at Texas A&M. 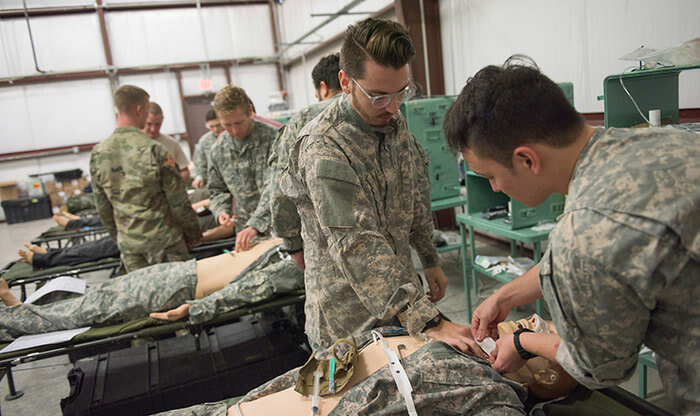 To expand on this commitment, the College of Medicine has launched two new programs to increase the number of medical students at Texas A&M who come from the military academies and the Texas A&M Corps of Cadets. Learn more about Medical Programs for Veterans. An applicant for admission who is a Texas resident may seek to enter this institution pursuant to the state's academic fresh start statute. If the applicant informs the Admissions Office in writing of his or her election under the statute, the institution will not consider academic course credits or grades earned by the applicant 10 or more years prior to the starting date of the semester in which the applicant seeks to enroll. An applicant who makes the election to apply under this statute and who is admitted as a student may not receive any course credit for courses undertaken 10 or more years prior to enrollment under this section. Transfer guidelines vary by component program. Decisions on transfer credit are made by the Office of Admissions and Academic Records or the registrar. Any questions should be directed to these offices first. Disputes concerning lower division courses are resolved by the following guidelines. If an institution of higher education does not accept course credit earned by a student at another institution of higher education in Texas, the receiving institution shall give written notice to the student and to the sending institution that transfer of the course credit is denied. The two institutions and the student shall attempt to resolve the transfer of the course credit, in accordance with the THECB rules and guidelines. The Commissioner of Higher Education or the commissioner's designee shall make the final determination about the dispute concerning the transfer of course credit and give written notice of the determination to the involved student and all involved institutions. Residency status is determined by the Texas Education Code. The Texas Higher Education Coordinating Board publishes rules and regulations explaining the process. Generally, an individual who has lived in the state of Texas for 12 months before entering an institution of higher education can be classified as a resident. Dependent students whose parents are Texas residents and claim them on their income tax are considered residents. An individual who comes to the state and enters an institution of higher education before residing 12 months is presumed to come for educational purposes and will be classified as a nonresident. Texas Higher Education Coordinating Board Rules and Regulations on Residence Status brochures are available upon request. All students are responsible for signing an Oath of Residency upon application to the programs of the Texas A&M Health Science Center. This oath is used to determine residency along with other information provided in the application. The student is responsible for responding truthfully to this request. Providing false information is cause for disciplinary action by the Health Science Center. Undergraduate students are required to take the Texas Academic Skills Program (TASP) test prior to enrollment. Although this test is not a part of admission considerations, the Health Science Center cannot award a certificate or diploma to an undergraduate student who has not passed all sections of the test or who has documented an exemption based on certain standardized test scores or factors specified in TASP examination application materials available through the registrar or Office of Admissions and Academic Records.